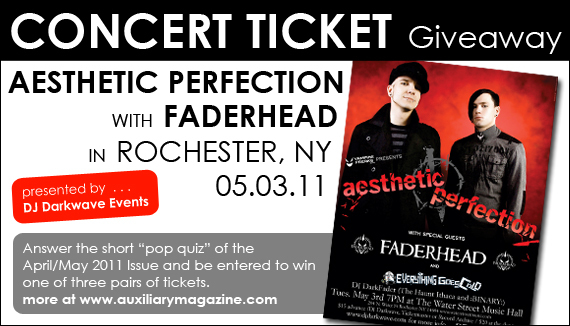 Auxiliary Magazine will be releasing a 2012 Calendar with the goal of generating excitement and support for, and to help promote, the best alternative artists, creatives, photographers, models, celebrities, bands, musicians, and fashion designers out there! The Auxiliary Magazine 2012 Calendar will be compiled of 12 photographs chosen from submissions. The calendar will then be available for purchase in select boutiques/stores and online. If you are a photographer or an artist, creative, model, celebrity, band, musician, or fashion designer that wants to be featured in the calendar submit your images to us! 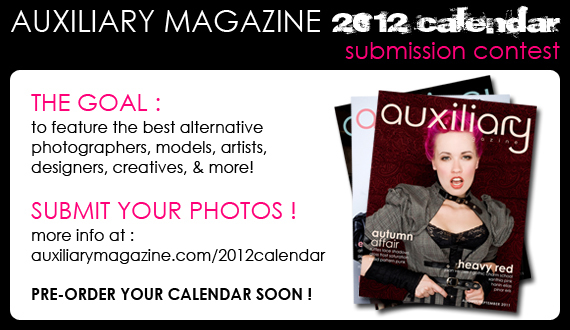 1 : Download the Auxiliary Magazine 2012 Calendar Submission Guidelines. You must read, agree to, and complete the forms in the Guidelines PDF. 2 : Email your submission to us by the deadline. Only complete submissions that include all required documents and information will be considered. Each month of the calendar will feature a different person or group, it will credit the photographer and creative team of the photograph, and will contain some information on the photographer, creative team, and the person or group featured. We encourage photographers, creative teams, and those who want to be featured to submit recent, unreleased photo sets or to organize a photoshoot to generate photographs for submission. Each person can submit up to 3 entries. Each entry can contain no more than 3 photographs. All the photographs in a single entry must feature the same person or group and be taken by the same photographer. Entries can be made by photographers or those wishing to be featured, but all entries must include the Auxiliary Magazine 2012 Calendar Grant of Rights / Contest Agreement fully completed and signed by the photographer. Summer 2015 Issue Out Now! 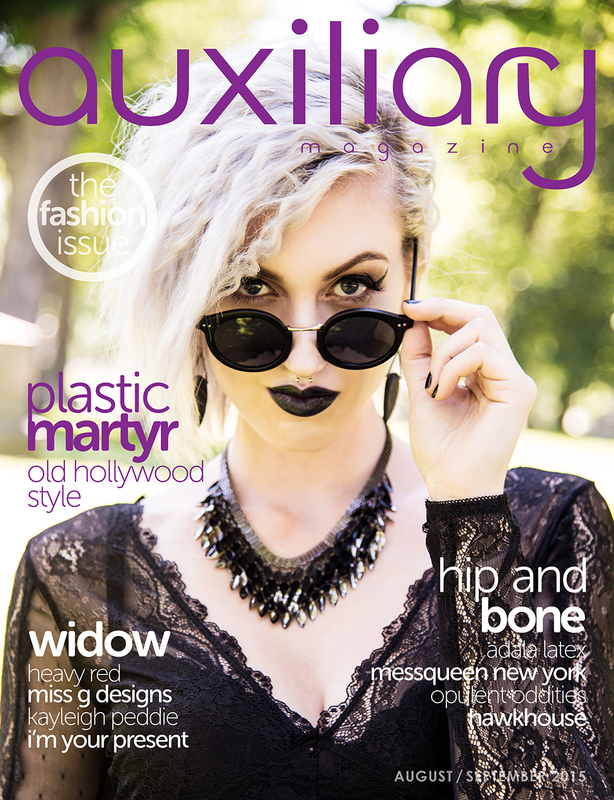 The Summer 2015 Issue is our fashion issue and features Plastic Martyr, Hip and Bone, Widow, and more!